We had this amazing day. Thought we were in a National Geographic episode or something. Went for a drive up to Canmore then down Spray Lakes Road and ended up turning into the parking lot across from Chester Lake Trail Head. (On the right going south.) 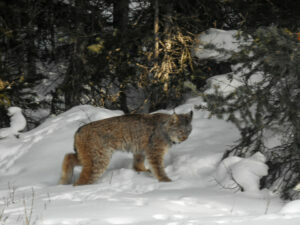 As we were going into the parking lot we saw something on the road – it was a Lynx. As the car approached it casually walk off into the woods on the right. Then a young one ran across the road in front of us following the first. 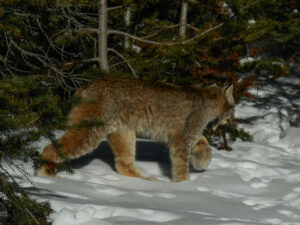 We backed the car up and Yvonne got a bunch of photos of the big one going through the woods. We parked, walked about and then got back it the car to see if we could find them again. 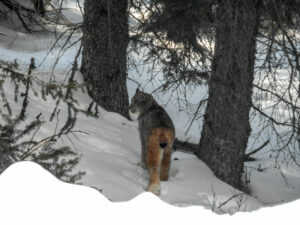 Decided to go across the road into the parking lot there – see what we could see. There were several other cars there – people loading up their cross country skis etc, getting ready to depart. I pointed ‘there’ to a couple of girls standing next to their car and – at the Lynx walking by near the edge of the parking lot. The girls had earlier seen a Marten(like a wolverine) trapped in the bathroom and took a branch to help it escape. It got out but looked pretty weak(sorry, no pics of the Marten). We watched it with several other people to see how it fared. 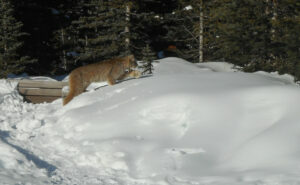 It was heading toward where the Lynx had disappeared and someone said wouldn’t it be weird if the cat got it. 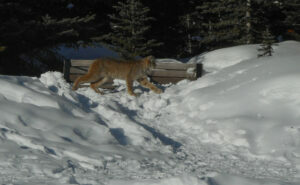 About 30 seconds later it came flying out of the woods and caught the Marten. Killed it instantly. That cat move incredibly quickly. I’m glad he wasn’t coming for me. The reason I think it was a ‘he’ is that he didn’t go find his ‘kitten’ to share – just devoured the varmint all on his own.